This work presents a technique for debris-flow (DF) forecasting able to be used in the framework of DF early warning systems at regional scale. The developed system is applied at subbasin scale and is based on the concepts of fuzzy logic to combine two ingredients: (i) DF subbasin susceptibility assessment based on geomorphological variables and (ii) the magnitude of the rainfall situation as depicted from radar rainfall estimates. The output of the developed technique is a three-class warning (“low”, “moderate” or “high”) in each subbasin when a new radar rainfall map is available. The developed technique has been applied in a domain in the eastern Pyrenees (Spain) from May to October 2010. The warning level stayed “low” during the entire period in 20 % of the subbasins, while in the most susceptible subbasins the warning level was at least “moderate” for up to 10 days. Quantitative evaluation of the warning level was possible in a subbasin where debris flows were monitored during the analysis period. The technique was able to identify the three events observed in the catchment (one debris flow and two hyperconcentrated flow events) and produced no false alarm. 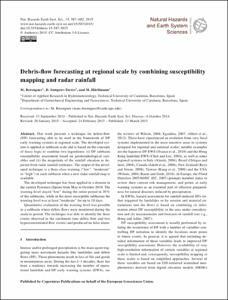 Berenguer, M.; Sempere-Torres, D.; Hurlimann, M. Debris-flow forecasting at regional scale by combining susceptibility mapping and radar rainfall. "Natural hazards and earth system sciences", 13 Març 2015, vol. 15, p. 587-602.